Just 800 metres from the best beaches of the Cap d'Agde seaside resort, flanking the 27-hole Golf International course, Palmyra Golf Hotel features 2 swimming pools, one of which is an indoor heated pool with solarium. With its complete range of facilities and spa, our 4-star hotel guarantees you a high-class stay. Golfers will love the 27-hole golf course overlooking the Mediterranean Sea, with the 3 combinations of 18-hole courses it offers across stunningly diverse landscapes. The Saint Thomas golf course is also nearby, just 25 minutes' drive away. Our 4-star hotel is also the perfect place to host your events, business or private, in Cap d'Agde. We have three air-conditioned rooms equipped with state of the art technology. The beach is just a short walk away, along the lively docks, where you can enjoy a stroll or take part in any number of watersports and leisure activities for all ages. The Hérault department abounds with wonderful places to walk, out in pristine nature; there are also lots of great places to eat here, where you'll find local produce, traditional cuisine and world-famous wines. Served in your room or in the dining hall. We'll serve breakfast in your room, so you can enjoy the superb view from your terrace. 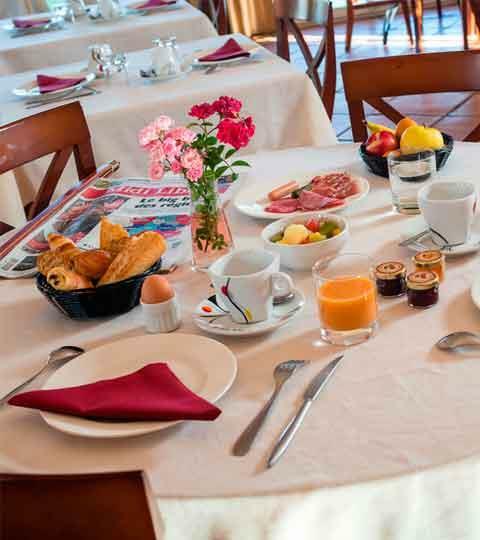 A continental breakfast (extra charge) is served in the dining hall every morning between 7am and 10:30am. 1 plenary room 125 m² and 2 break-out rooms. 27 holes, or 3 combinations. (Steam room, sauna, whirlpool, massages).